Handling of fine products in a dry or slightly greasy or soiled environment. Assembly and electrical components (semi-conductors, microprocessors). Mounting and assembly of mechanical items in the automotive industry and in subcontracting. Packaging, presentation, separation of small items. Assembly and electrical components (semi-conductors, microprocessors). Mounting and assembly of mechanical items in the automotive industry and in subcontracting. Packaging, presentation, separation of small items. Excellent dexterity. Certified “silicone free” to allow for use in a paintwork environment. Fine handling in a dry, lightly greasy or dirty environment. Excellent dexterity. Certified “silicone free” to allow for use in a paintwork environment. 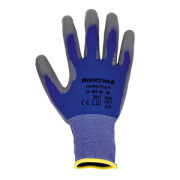 Fine handling in a dry, lightly greasy or dirty environment.